Dynamic swimlanes allow you to design flexible processes. Let's say there is a company with several legal entities. In the accounting department, each employee is responsible for a certain legal entity. Consider a process for approval of incoming contracts in the accounting departments. Create a new object - Our Company. Add Name and Accountant properties. Then create a contract approval process with a dynamic swimlane for the approver. To define the swimlane with a script, the swimlane must be dynamic. When you change the swimlane type, ELMA Designer will suggest creating a variable for storing the user. 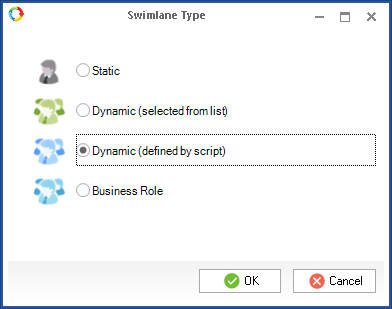 It is important to know that there are two types of dynamic swimlanes: Dynamic (selected from list) and Dynamic (defined by script). You can use either of the two, but the swimlane defined by script allows you to store a script for calculating the variable value. You can add the Script graphic element before the connector going to the required swimlanes, as shown below. However, for better readability, we advise placing the script within the required swimlane. Although there are cases when the executor must be chosen before the process goes to the following swimlane, for example, if the initiator has to know which employee will be approving the contract before actually assigning the task. 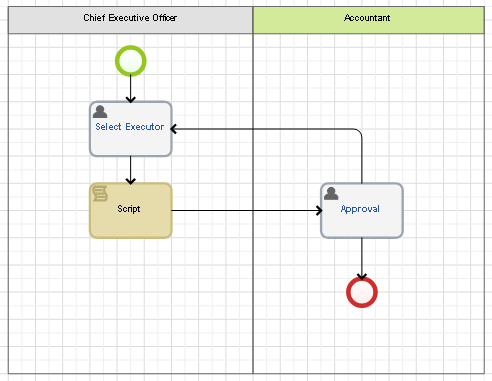 When using scripts to define swimlane, make sure that the script will be always executed correctly and on time. Otherwise, the logic of the process might be broken leading to errors in process execution.